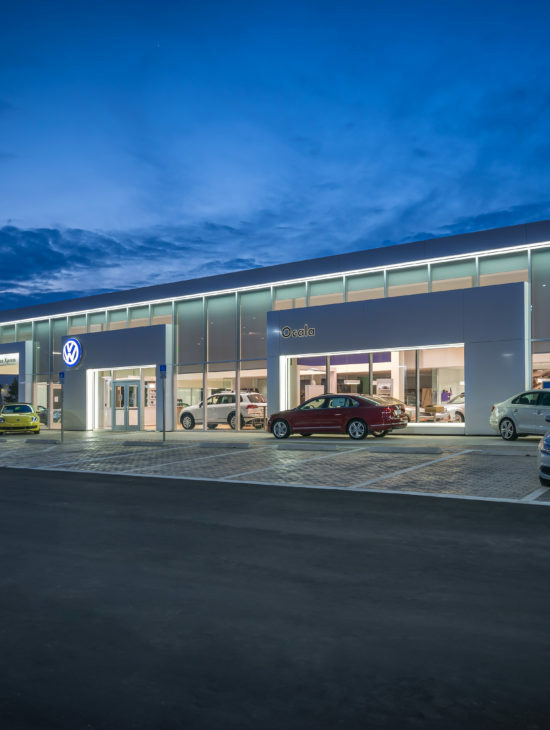 Volkswagen of Ocala – Spring Engineering, Inc. In 2012, Spring Engineering, Inc. was again commissioned by the Gettel Automotive Group to develop and design a 22 acre site containing three separate automotive franchises. 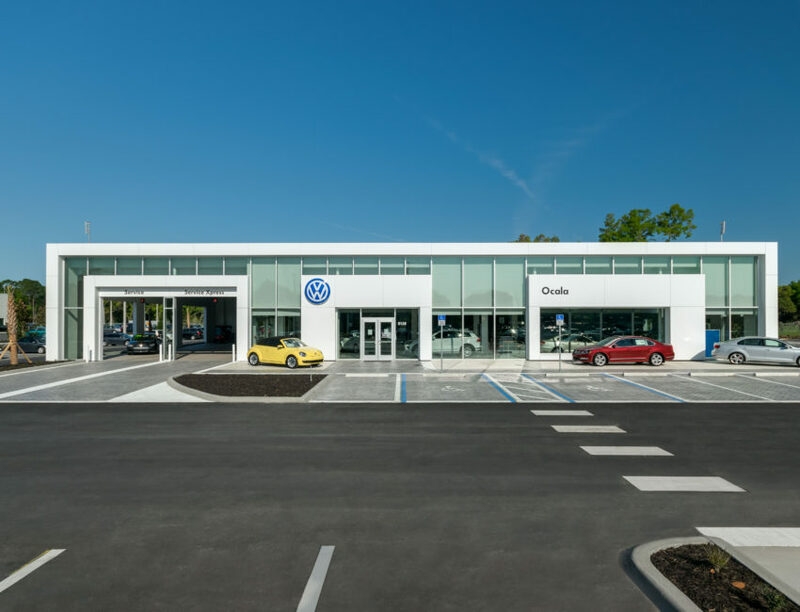 One of these three dealerships, as shown here, was VW of Ocala. 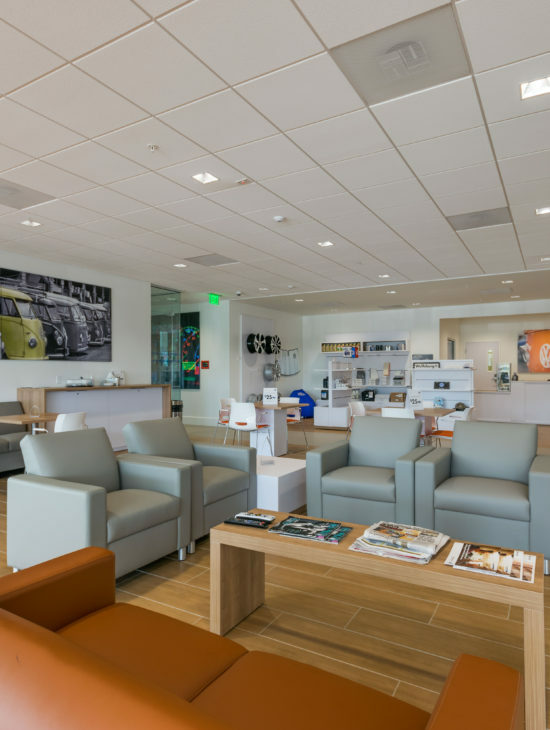 Encompassing 21,684 S.F., VW Ocala consists of a high end showroom to display the VW brand, a state-of-the-art 12-bay service department, parts storage and administrative offices. The façade is a blend of highly energy efficient window systems and white frames clad with aluminum composite panels that are illuminated at the perimeter creating a dynamic scene after sunset. These white frames create focal points for key elements of the facility and define the name of this current prototype, the “White Frame” concept. This project also includes a standalone 3,345 S.F. carwash facility. The dealership is located at 5135 Southwest College Road in Ocala, Florida just west of I-75.